Provides a non-rotating connection of sheet metal parts thereby setting the geometry between two parts. 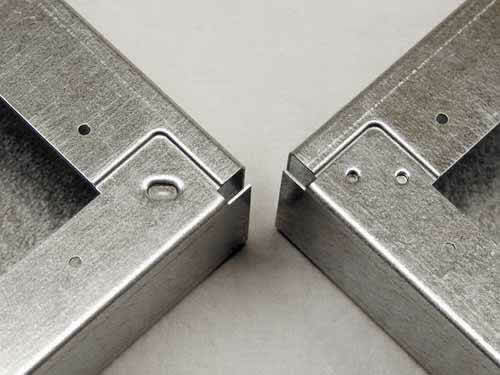 BTM now designs, engineers, assembles, and manufactures the Geo-Clinch™ line of clinch joints which provide a nonrotating connection of sheet metal parts thereby setting the geometry between two parts. Using only a single stroke, Geo-Clinch™joints will “geo-set” 2 sheet metal parts in their proper GD&T orientation. Parts can then be transferred to secondary fastening operations without complex and expensive tooling for locating and clamping. Joints designed, engineered, assembled, and manufactured under the Geo-Clinch™ line consist primarily of Oval-Loc™ and Lance-N-Loc™ punch and die tooling. An Oval-Loc™ joint (left) vs. two round joints (right). With Oval-Loc™ or Lance-N-Loc™, only a single joint is needed to obtain rotation-resistance.